Decorate and add accents to a variety of items, even non-porous materials such as glassware and terracotta. 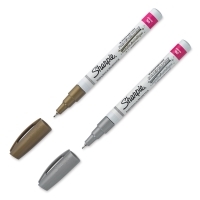 They're great for touching up wood and metal, personalizing belongings, or adding pizzazz to school projects. 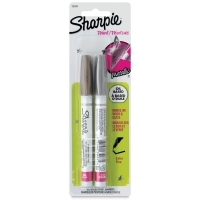 Sharpie Oil-Based Paint Markers contain ink that is water–, fade–, and abrasion–resistant, as well as quick drying. 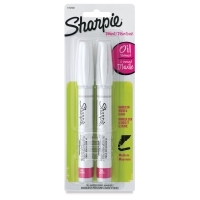 They go on smooth and opaque, with no mess. Choose bold point for large lines or darkening, medium point for broad sweeping lines and washes, fine point for precise writing and touch up, or extra-fine point for perfect, ultra-precise lines. 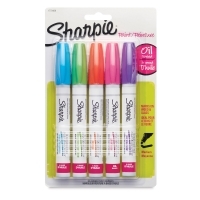 Set of 5 Fashion Markers — This set includes one each of the following colors: Aqua, Lime, Orange, Pink, and Purple. 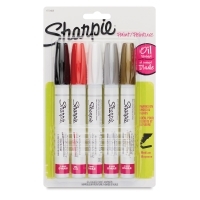 Assorted Set of 5, Fine Point — This set includes one each of the following colors: Black, Blue, Red, White, and Yellow. 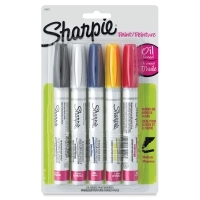 Assorted Set of 5, Medium Point — This set includes one each of the following colors: Black, Blue, Red, White, and Yellow. Assorted Set of 5 w/ Metallics, Medium Point — This set includes one of each of the following colors: Black, Gold, Silver, Red, and White.